Does anyone fly out in Fresno Ca. 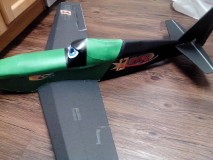 I am looking for a rc club or meeting area to fly my planes. I am recently back to the hobby and just itchin to get my version of rip slinger (FT Racer) up in the air. Thanks to flight test for the plans. Much appreciated! My son and I were able to build this one together....great memories there! thanks again flight test! Im in Fresno also. The only real place I am aware of is Madera field. I am very new and too intimidated to go out to that field. I fly in the fields on fowler ave along with some heli guys. The Madera field is nice. Dry and dusty, but nice. I live in Selma. Madera is too far for me to do on a regular basis. Thankfully, I can fly out of my yard. Clovis Area Modelers Club is a great group of guys willing to help out newcommers. They have about 85 members an 2 really nice flying sites. www.ClovisRC.club is the website check it out.